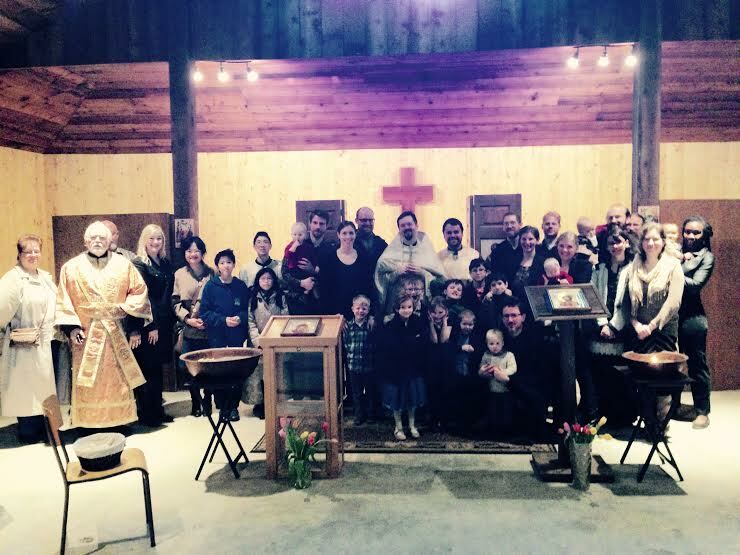 February 7 & 8th marked the first liturgical services of the Holy Apostles Mission Station in Chilliwack, British Columbia. It was the culmination of a season of prayerful planning, but also the beginning of something new that the Lord has established and blessed. Established by His Grace, The Right Reverend Irénée, Bishop of Ottawa and the Archdiocese of Canada, the Mission Station was blessed in November 2014. Fr. Matthew Francis and his family arrived in Chilliwack in late January, and took up his assignment as Priest in Charge. 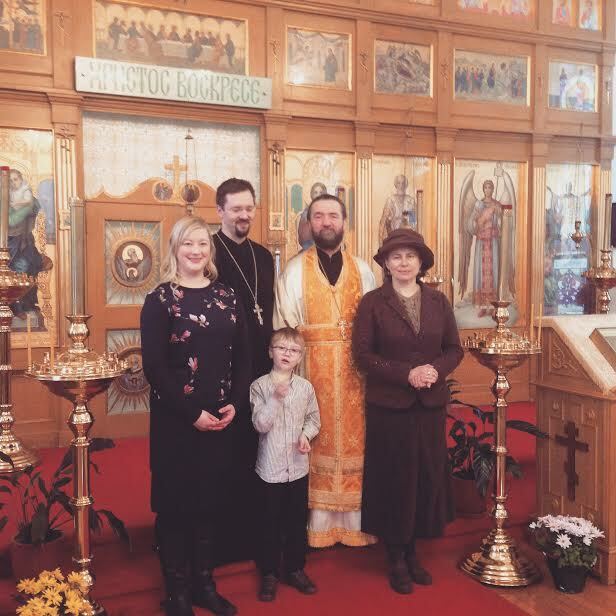 Last Sunday, he received the blessing of the Dean of BC, Archpriest Michael Fourik, and this week the Holy Apostles Mission Station witnessed its first services. Some of the gathered faithful after the Divine Liturgy. 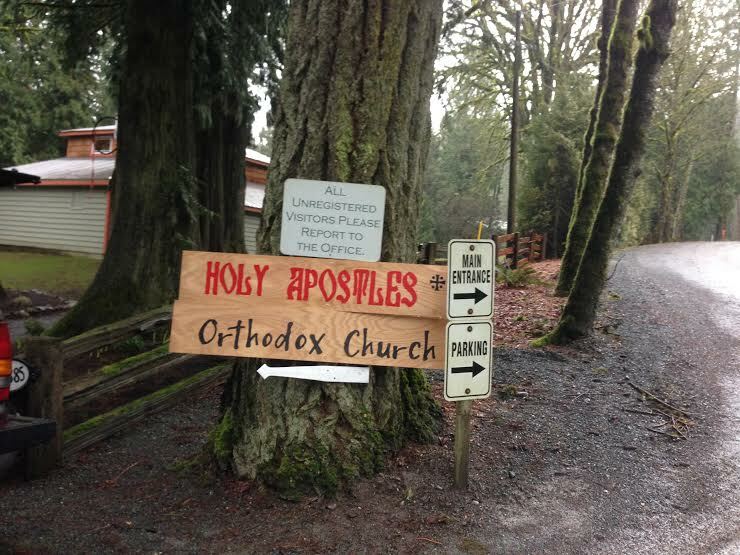 The services of Great Vespers, Matins, and the Divine Liturgy for the Sunday of the Prodigal Son were held in the historic Tabernacle building on the grounds of Charis Camp and Conference Centre, about 10 minutes east of downtown Chilliwack. The seasonal Fraser Valley rains did not deter the faithful who gathered for Great Vespers on Saturday evening. And, come Sunday, the sun broke through the clouds to accompany the offering of the Divine Liturgy. Father Matthew was blessed to serve together with local BC Deanery clergy Father Richard Rene (Chilliwack, BC) and Deacon Peter Choi (Vancouver, BC) for the Divine Liturgy. Subdeacon Barnabas Neufeld also provided valuable liturgical assistance. Following the Divine Liturgy, members of the interim Mission Council, a dedicated group of parishioners that have been working with Father Matthew to organize and establish the community, were blessed. In addition, the Mission Station is blessed with experienced directors of Church music, who also received a blessing to fulfill this vital Church ministry. We would like express thanks for the prayers and encouragement of our Bishop, His Grace Irénée, and of so many others across the Archdiocese of Canada and beyond. Our hope is that we may faithfully bear witness to the love of Jesus Christ, raising high His Holy Cross over the eastern Fraser Valley. Please continue to pray that the Lord will establish this vine of His own planting in the beautiful Chilliwack area! The sun shone into the Tabernacle at Camp Charis, where the Divine Services were offered. Deacon Peter Choi, from St. John of Shanghai Mission in Vancouver, BC, joined us for the first Divine Liturgy. Deacon Peter proclaimed the Holy Gospel for the Sunday of the Prodigal Son. Fr. Matthew gave the sermon. Some of the singers composing the Choir, led by Presbytera Jaime Rene. The Holy Gifts are carried in procession at the Great Entrance. Some of the gathered faithful after the Mission Station’s first Divine Liturgy. Some of the faithful gathered after the Divine Liturgy.